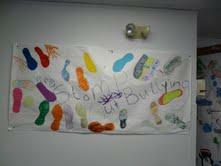 Students made anti-bullying posters to hang on the walls at Lincoln Middle School. Like all districts in the state, the schools in Green River were required to institute an anti-bullying program. But principals say bullying hasn’t really been that big a problem in Green River. So the program they’ve instituted focuses on teaching kids good manners. They say kids very much need a dose of civility, and that better behavior should prevent bullying before it becomes a major issue. WILLOW BELDEN: Last year, a second grader at Jackson Elementary School in Green River came home in tears. He told his mother that another little boy was bullying him. She asked that we not use their names because she’s worried her son could face repercussions. But she was happy to share the story. She says it got so bad that her son would start crying hysterically when it was time to walk to school in the morning. MOTHER: Finally I drove them to school, and he wouldn’t get out of the car. And this happened for about a week and a half – same thing every morning. BELDEN: Now, this wasn’t a severe case of bullying. She says the other little boy probably wasn’t even trying to be mean; he just got rambunctious and ended up pushing and shoving. And she says the problem did stop. MOTHER: The school was great. You know, I talked to the teacher and the principal and the counselor. But it took a long time just to make him feel safe coming to school, which is really sad. BELDEN: The incident is exactly the type of thing that Jackson Elementary’s new anti-bullying program is trying to prevent. Two years ago, the school started doing Positive Behavior Interventions and Supports, or PBIS. Principal Stacey Court says it’s basically a system for teaching kids what kind of behavior is appropriate and rewarding students who set good examples. STACEY COURT: What we want to do is instruct students how to walk down the halls, how to play on the playground, how to go to the lunch room correctly, bathroom – those type of things. And we talk about what does it look like to be respectful, what does it look like to be responsible, and what does it look like to be safe. BELDEN: In other words, even though PBIS is billed as an anti-bullying measure, what the school is really doing is teaching good manners. At the beginning of the school year, they have a big kick-off, where they put on skits, have discussions about good behavior … and even teach the kids a little song. A group of fourth graders demonstrates for me. BELDEN: There are several types of rewards for good behavior. First, your name might go up on a bulletin board. As the principal and I walk down one hallway, a little girl points proudly to her name. She says she’s on the bulletin board because she helped out her teacher. LITTLE GIRL: When she said to clean up, I cleaned up everyone’s spots, because they were too much messing around. BELDEN: The principal, Stacey Court, says public recognition like that is a good way to motivate kids to do nice things. Another motivating force are the so-called Jag Tags, which are the school’s version of monopoly money. You get a Jag Yag when you do something exemplary … and then you can use that to buy things at the school store. Court says the school is already seeing a difference. COURT: I think one of the exciting things is that the children will say, ‘Don’t bully me.’ And they tell someone instead of hiding it. And that’s great. BELDEN: Then again, there wasn’t much bullying at Jackson Elementary to begin with – usually only one or two cases per year. Still, Court says kids don’t all learn how to behave properly at home these days, so the school is trying to fill that void. Mark Rose, the principal at Lincoln Middle School, just down the road, agrees that kids need to learn basic manners at school. ROSE: You know, wait in line patiently. … In the cafeteria, eat your own food; just don’t grab it off of somebody else’s tray. Middle schoolers will do that – can you believe it? BELDEN: Plus, he says, if kids are civil to each other, small conflicts are less likely to escalate – which means bullying is less likely to become a big problem. MARK ROSE: When you get kids that are out of control – let’s say they’re running – so, they bump into somebody in the hall. Well then that turns into a confrontation. Well then that turns into somebody pestering somebody else. So they really are connected: the culture in the school and the climate in the school really is connected to bullying. BELDEN: Rose says the PBIS program is making a difference in how his students treat each other. But a school can only do so much. The mother we heard from earlier, whose son was bullied, thinks the good behavior program is a great step … but she says families need to step up to the plate too. MOM: It’s the parents’ job to make sure that their children are behaving properly. … And so when bullies act a certain way, and their parents aren’t involved in fixing the problem, they become part of the problem. BELDEN: Still, school district officials hope that by teaching kids basic manners, they’ll nip the problem in the bud and keep bullying from becoming a major issue in Green River. For Wyoming Public Radio, I’m Willow Belden.